Hubs sent me this picture earlier last week. 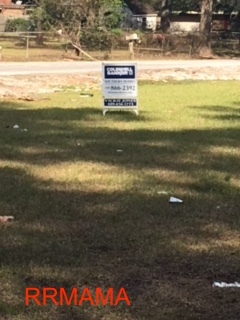 Yep, that is a for sale sign in our yard. And yes that is our scrapped out yard in the background from the trucks that picked up the contents of our flooded home. Part of the tag line in the listing says, "flooded and gutted". It's a bittersweet moment. I'm happy that it's on the market and hopefully it will sell quickly but it's also sad. This was the home that has built me for most of my adult life. This was the home that hubs and bought right after R1 turned 1, so he has grown up in this house. This is the house that we brought R2 home from the hospital so he's grown up in this house as well. So many firsts for my boys happened in this house. This is the house we put a swing set with a fort in the back yard so the boys could have some fun when they were little. This is the house where my father in law gave me some of the day lilies from his backyard to put in our backyard because they originally belonged to his mother. (They were beautiful) This is the house where my kids learned how to make pancakes and how to use milk instead of water to make them extra fluffy. This is the house where they helped Hubs make his epic size portions of Chex Mix. This is the house where we have held countless BBQ's and Easter egg hunts. This is the house we have popped countless fireworks on the 4th of July and New Year's Eve. This is the house where Hubs has cooked so many wonderful steak dinners I can't even count them. This is the house where one night we all laid on the driveway and watched a meteor shower. This is the house that we remodeled after Hurricane Ike put three trees in it. We thought about putting it on the market then but something deep inside told us no. We liked the changes that we made so we decided to stay and continue to raise the boys in the "new" house. Hurricane Harvey however has changed our minds. We decided together that we just didn't want to stay and remodel again. I did not want to worry every time there was a hurricane if it would come our way and flood our house again. One flooded house is one to many in my eyes. So we have a plan and we are hopeful that is will all work out, quickly. We hope our plan is God's plan too. But we do know that whatever the plan is, God is in control and He already knows how this journey will end. We know that whatever it is, because we have faith in God, it will be amazing! Good luck as you sell your house. I hope all your plans work out and you can put Hurricane Harvey behind you!